The run will also proceed to Antelope Island and the first runner will be able to participate in the “King of the Mountain (KOM) challenge. This is a 1.1 out-and-back route going up a 23% grade, so you will want your strongest climber here. The first half of the run is more challenging with some climbing and rolling hills while the second half is more flat. Again this is self-supported with no aide stations so pick-up what you need at exchange zones or carry it with you. The race finished up at the Jensen Nature Park in Syracuse. 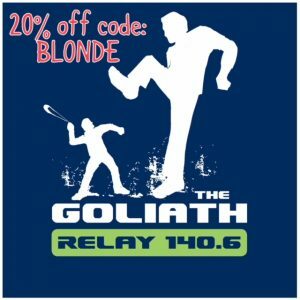 RACE DISCOUNT CODE: “BLONDE” saves you 20% before July 1st! 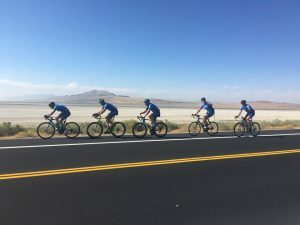 This is the 4th year of the event and another cool thing about this race is that it helps raise funds for the DE NOVO PROJECT allowing Adolescents and Young Adults who struggle with addiction and mental health issues like severe depression, anxiety, PTSD and other mental health concerns to get need mental health services. They can also help individuals and families caught in the wake of suicide and traumatic death. What are people saying about the race? Note: You have 14 weeks from June 9th to great ready for the September 15 event. Not a triathlete? No problem, the race also offers a 5K event for the whole family. You can still spectate for your friends/family and join in the fun at 11 a.m.